Transit Maps of the World was an extraordinary and unexpected success and is now a cult favorite. 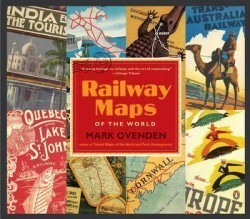 In his irresistible follow-up Mark Ovenden has produced a mesmerizing compendium of historical and contemporary railway maps and posters from every corner of the world. Hundreds of images, covering two centuries of railway advertising, surveyors' plans, travel posters, satellite photos, and station wall maps, are combined with text brimming with vivid historical details and charming anecdotes. Part One presents the stunning visual material chronologically, from the Liverpool and Manchester Railway of 1830 to the proposed 2020 high speed networks of China. Part Two is an atlas of maps from more than one hundred countries from Algeria to Argentina to Zambia and Zimbabwe. Appendixes include a trove of factoids, track stats and information about rail operators and rail museums. 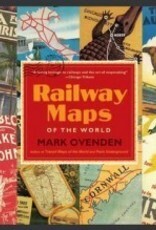 Railway Maps of the World is a visual delight for your eyes, making it a must have for every train fanatic-armchair or ticketed-history buff, and lover of graphic design.